Oh Ina, so annoying but such yummy recipes. I’m sorry to all you “Barefoot Contessa” fanatics, but I just sit on the brink of a breakdown every time I see her show. I force myself to occasionally watch since some recipes are worth trying. As you have surely noticed by now, the theme as of late has been food gifts. I made a chocolate basket of sweet happiness for my grandparents this Christmas (including two previous posts), and this is yet another sweet jumble from that gift. I had the good fortune of using Havana Club Rum, but since most of my readers have not traveled to that forbidden paradise, I’ll suggest you use any rum of your choosing. The recipe calls for dark rum, but I say use whatever (excepting a spice rum, of course, that might be a little funky). The recipe is all in weight, so hopefully you have a kitchen scale. Sorry, I prefer not to post this way so as not to scare anybody off, but hopefully the approximations I’ve included will make it less intimidating. Chop up 175 grams of the milk chocolate into small pieces (about 6 oz). In a double boiler, heat heavy cream until hot to the touch. Remove from heat and add chopped chocolate and butter, mixing until melted. In a mini food processor or blender, process rum and raisins until finely minced. Stir into chocolate mixture. Set aside at room temperature for at least 6 hours or overnight to cool. It will become almost like a heavy mousse in consistency. 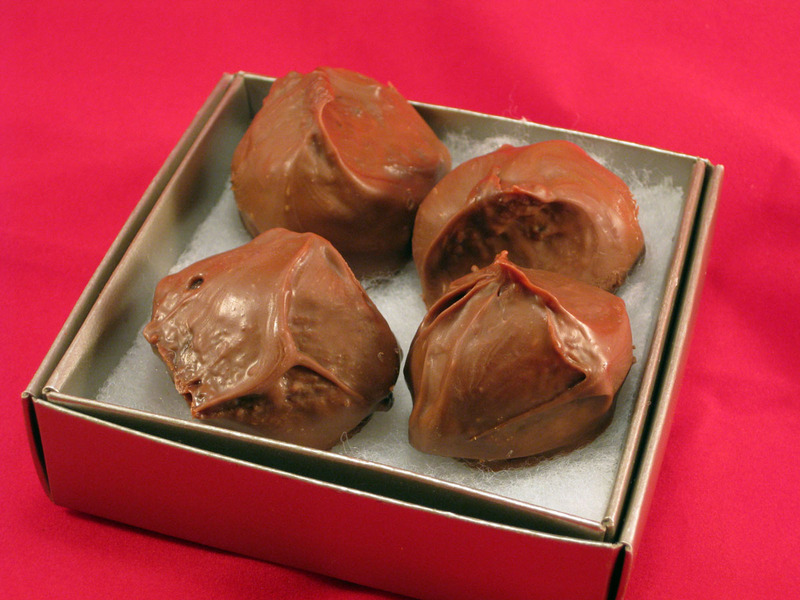 Scoop balls approximately 1″ diameter and place on a sheet lined with parchment paper. Chop remaining chocolate and place 3/4 of it in a small microwave safe bowl. In 20 second increments, heat and stir, repeating until chocolate is smooth and shiny. Then, stir in the remaining 1/4 of the chocolate. As it melts, it will reduce the temperature of the chocolate. It should register 85-59 F on a candy thermometer. With two spoons, pick up each truffle and cover it with the melted chocolate. (Or use your hands!) They don’t have to look smooth. Return to parchment sheet and let them sit at room temperature to harden. Enjoy! This entry was posted in Candy Jumbles and tagged chocolate, rum, rum raisin, truffles. Bookmark the permalink.